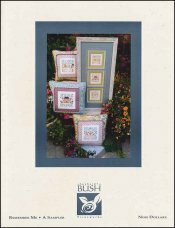 Remember Me - A Sampler [H5695] - $9.00 : Yarn Tree, Your wholesale source for cross stitch supplies. Cross stitch pattern by Shepherd's Bush Printworks. A sweet design that you combine as shown framed or make into pillows. Each square has a little scene in the center and is accented with alphabet letters. The verse; "When this you see remember me" is split between the top and bottom design. Stitch count per square is 40 x 40.